______ 1) Read the passage The Day I Took the Spotlight. While you read plot the story on a story plot. ______2) Answer the questions below. - What was the conflict that happened to the main character and what was the resolution? - Where did this experience happen? - When did this experience happen? - Who was involved in this experience? - How did the author feel before the experience? - How did the author feel during the experience? - How did the author feel after the experience? - What did the main character learn about themselves? 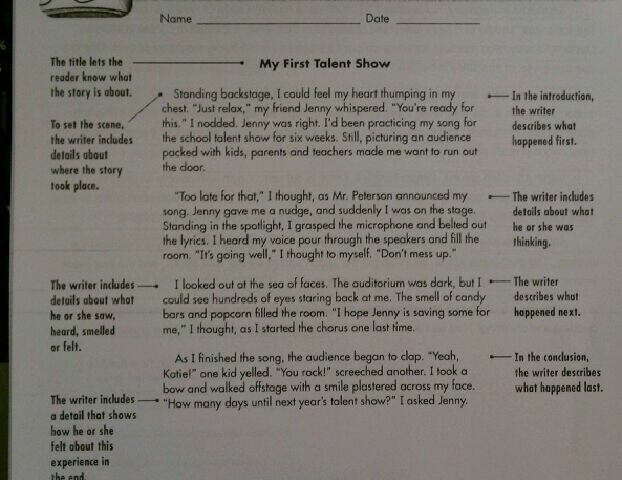 ______3) Read the passage My First Talent Show. While you read plot the story on a story plot. _____4) Answer the questions below. ______5) Brainstorm before prewriting for your personal narrative by answering the questions below. - List three or more examples of things that you were afraid to do before you tried them for the first time. Circle the experience that you would like to write about. - How did you feel before the experience? - How did you feel during the experience? - How did you feel after the experience? - What did you learn about yourself? ______5) Prewrite your personal narrative on a story plot. ______ 6) Draft your personal narrative. - Did you use dialogue? - Did you separate events into paragraphs? ______7) Edit and revise your personal narrative. 1. What is the setting of the passage? 2. What is the conflict in the passage and the resolution in the passage. 3. What is the climax of the story? 4. Give a word that describes Dr. Paws. 5. 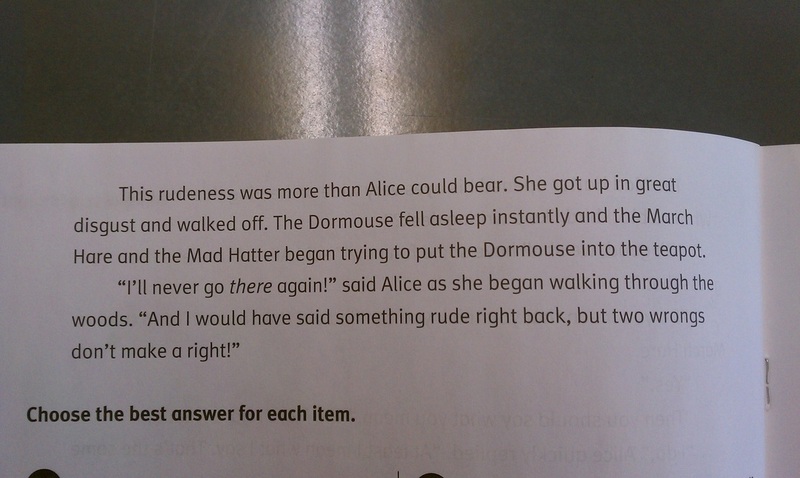 Which line from the passage contains a metaphor? 6. A dog and a cat having a conversation is an example of what figurative language? 7. Why does Dr. Paws like Betsy? 8. What is the author’s purpose for writing the passage? d) entertain the readers with a story about two pets. 9. Why does Dash chase Ginger away? 10. Define the word baring as used in the passage. 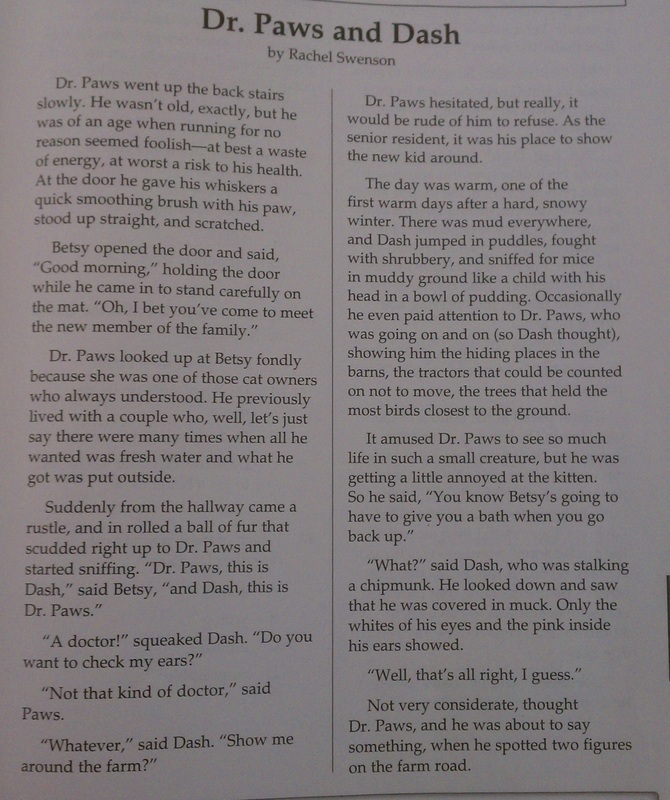 At the beginning of the passage, Dr. Paws thought Dash was annoying. 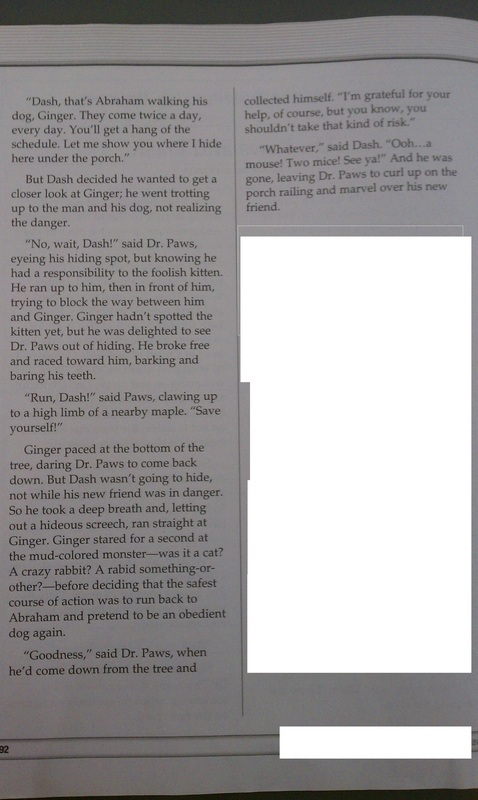 What happened in the passage to change Dr. Paw’s opinion? Use at least two examples from the passage to support your response. 1. Why are the Bread Man’s hands dusted in flour? 2. “’Just a taste!’ a cake beckons” is an example of what type of figurative language and why? 3. Which would be the best new title for this poem? 4. Define the word lure as used in the passage. 5. Using the suffix –ment what does the word amazement mean? 6. Define the word luscious as used in the passage. 7. Give a simile given in the fifth stanza of the poem. 8. Which sentence from the third stanza has alliteration? 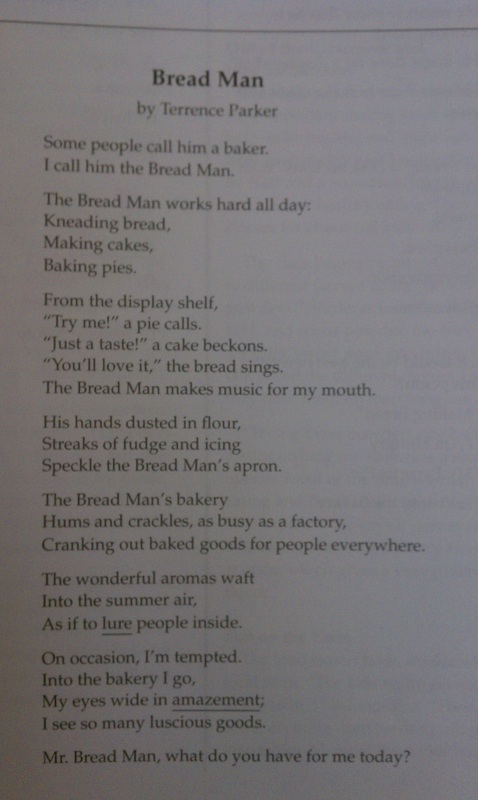 What does the poet think about the Bread Man? Give details from the passage to support your answer. 1. Using the suffix –less define the word endless as used in the passage. 2. What is the author’s bias about the Happy Treats jingle? 3. What was the genre and point of view of this letter? 4. Give an example of exaggeration used in the passage. 5. Give a fact given in the passage. 6. Give an opinion given in the passage. 7. Define the word focus as used in the passage. 8. What is the main idea of the passage? 9. 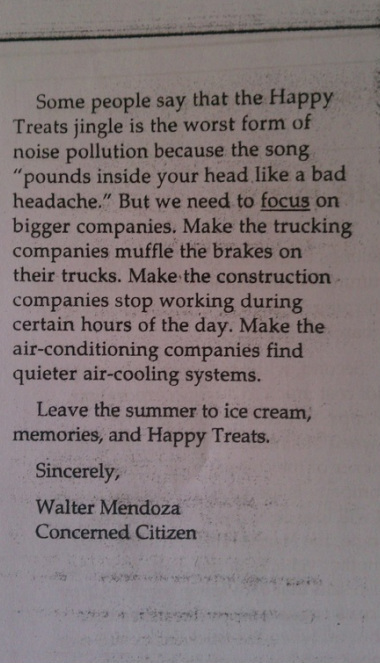 What is the reason that the author wrote this letter? 10.How is the text organized? d) provides different reasons why the Happy treats jingle should be allowed. 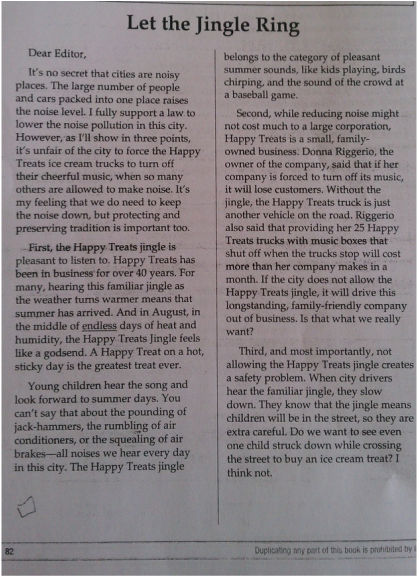 Do you think that the Happy Treats trucks should be allowed to play their jingle? Use details from the passage to support your answer. 1. Give a simile used in the passage Winter Time. 2. In the poem Winter Time, the author writes, “Late lies the wintery sun a bed.” What type of figurative language is this? 3. 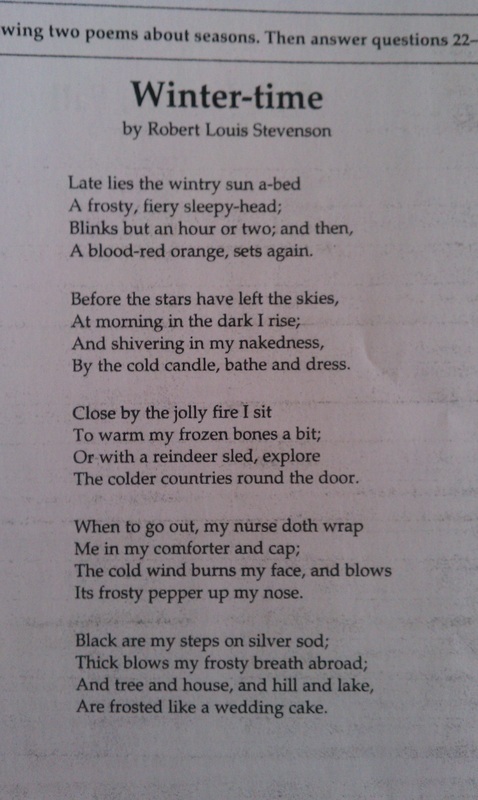 What is the nurse doing in the poem Winter Time? 4. Give a word that describes the speaker’s feelings about winter in the poem Winter Time. 5. Who is the narrator of the poem Winter-time? 6. What is the main idea of Fall, Leaves, Fall? 7. Based on the poem Fall, Leaves, Fall, what can you infer that the author thinks about winter? 8. What does the word ushers mean as used in the passage Fall ,Leaves, Fall? 9. What type of weather can you infer that the author of Fall, Leaves, Fall likes? 10. What is the author’s purpose, genre and point of view of Fall, Leaves, Fall? 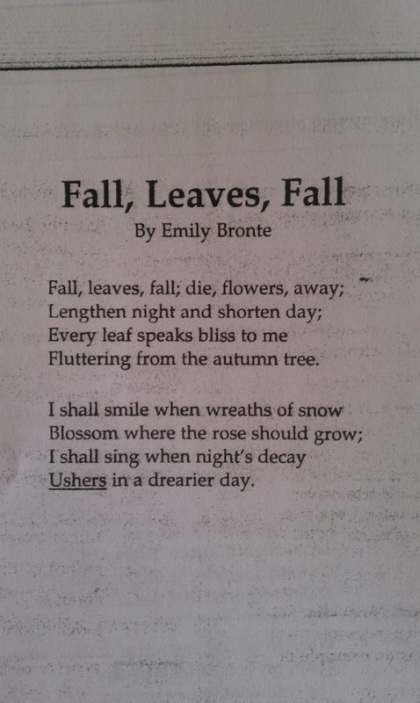 Describe one similarity and one difference between the poems. Use at least one detail from each passage to support your response. 2) Why didn’t George Washington Carver attend school when he was young? c. He did not like subjects like science and math. d. The only subjects the school offered were music and art. e. He had to stay home and work in the plantation garden. f. There were no schools for people of his race. 3) Which is a statement of opinion? 4) Read this sentence from the passage. What does the word train mean as used in the sentence? b. The school stopped teaching classes about agriculture. c. He decided he wanted to study botany at another college. d. He needed to work at Tuskegee to pay for his education. 7) Which statement best states the main idea of the passage? a. George Washington Carver’s idea of crop rotation allowed many farmers to grow more than one crop on their farm each year. b. George Washington Carver’s fascination with plants led him to important discoveries that benefited many Americans. c. President Roosevelt decided to make a national monument to honor George Washington Carver. 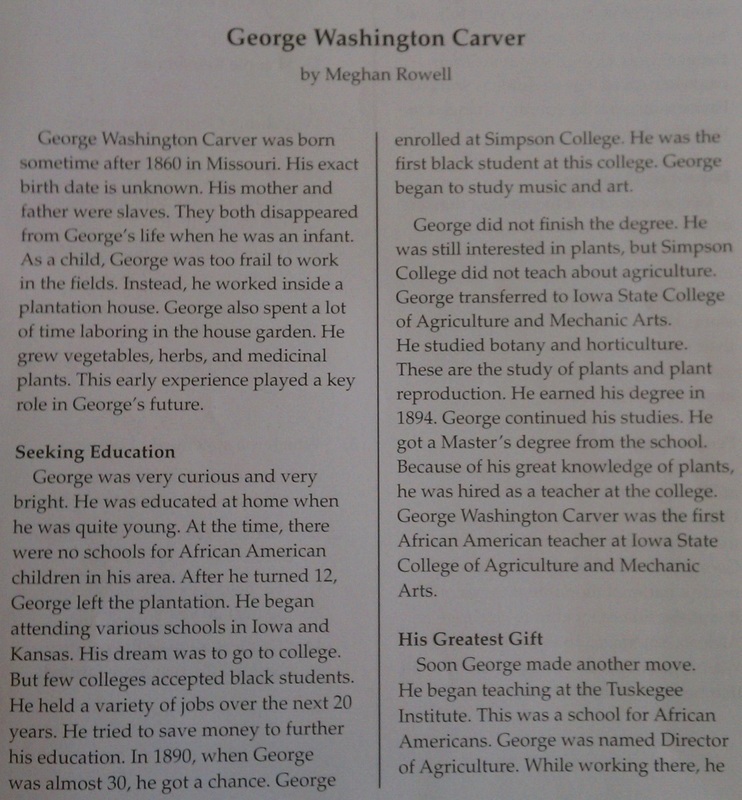 d. George Washington Carver overcame many odds to be the first African American man to attend Simpson College. 8)Define the word unknown using the prefix –un. 9) Define the word inventor using the suffix –or. 10) Define the word monument as used in the passage. Give a character trait to describe George Washington Carver. Use details from the passage to support your answer. What is the genre, point of view, and author’s purpose for the section. 1. What is the moon compared to in the last line of the passage? 3. Define the word descending as used in the passage. 4. Give a synonym for the word shine as used in the passage. 5. Give a synonym for the word seek as used in the passage. 6. Give an line that almost has alliteration. 7. Give a simile used in the passage. 8. What is the setting of the passage? 9. What is the main idea of the passage? 10. What word is repeated throughout the poem and why? 1. What is the genre, author’s purpose and point of view of the passage? 2. What does the word impatiently mean? 3. What is the climax of the plot in this story? 4. What is the conflict and resolution of the passage? 5. Who is telling this story? 6. What is the theme or lesson of the story? 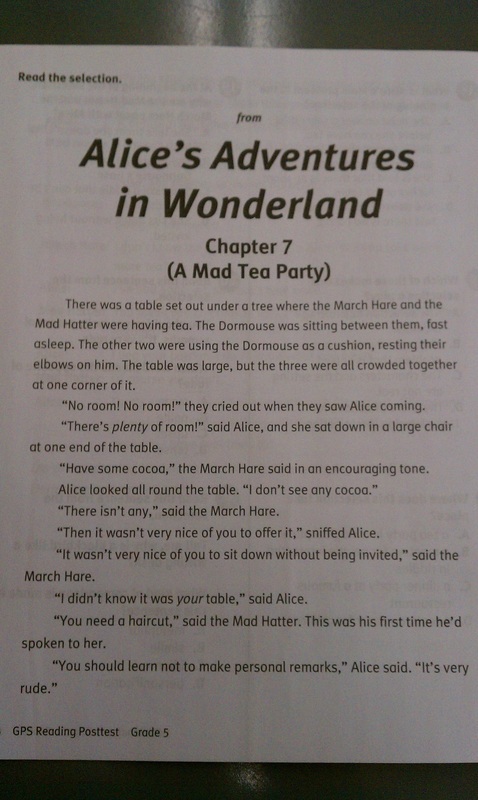 7.What do you think Alice will do if she sees the Mad Hatter and March Hare sitting at the table again? 8. Define the word minute as used in the passage. 9. What is the setting of the passage? 10. Give a character trait to describe the mouse. 1) What is the conflict and resolution in the passage? 2) What is this passage mainly about? 3) What would be another good title for this story? 4) What is the theme of the passage? 5) How does Denisefeel when Grandma first tells her to set the bird free? 6) As used in the passage what does the word Lagniappe mean? 7) How does Grandma feel when she meets Denise at the train? 8) Which sentence from the passage contains a simile. a) My heart skipped like a stone across the stream. b) I put my hands on my hips and stamped my foot. c) The bayou is where my Grandma lives, a place swamped in mystery to me. 9) What is the genre, author's purpose and point of view? - Summarize what happens in "Sweet Magnolia." Use details from the passage to support your answer. My sisters Iona and Geneva had gone long before me. I was impatient, waiting my turn. One evening, I blew out the six candles on my birthday cake, and Mama said, “Baby Girl, you are bayou-bound.” Mama still calls me Baby Girl sometimes, even though my name is really Denise. The bayou is where my Grandma lives, a place swamped in mystery to me. Now, I’d get to see it for myself. Two days later, on the train, I thought about the treasures Iona and Geneva had brought back from Grandma’s. Iona had found a delicate snake skin that a diamond-backed water snake had crawled right out of and left behind. Geneva had brought back a dragonfly with a body like jewels and wings like lace. It seemed to me like I was on the train for a week full of hours before the conductor finally said, “This is your stop, Miss.” My suitcase and I got off and stood waiting. Suddenly Grandma was standing there smiling at me. “My, my, my!” she exclaimed. Her eyes said even more than her words. Outside Grandma’s house was the most beautiful tree I had ever seen. It had pinkish-white flowers as wide as my open hand and it smelled as nice as Geneva does when she goes out on a date. “Grandma, what is it?” I asked. `I took another whiff. “Sure do,” I agreed. “Let’s go see the bayou,” said Grandma, and we got into her boat. Soon we came to a different sounding place. We got out of the boat, and I hushed so I could hear it all—tiny tickings, gentle jigglings, ripplings, and rustlings—little life sounds all around. “Talk about trees!” I gasped, looking up. They were hunched over like bent giants. Moss was hanging in haggy clumps from their branches like ragged curtains. “The bayou,” I whispered. Suddenly I heard a tiny cheeping. There was some pain and fear in it. “Over there,” said Grandma, pointing. I ran, then stopped short, so I wouldn’t step on the struggling bird. Grandma carefully scooped it up. She shook her head. Grandma warned me, “Sometimes nature doesn’t see things our way.” But she looked in my eyes, and we took the bird on home. “What kind is she?” I asked. the broken leg and taped it. I studied the soft feathers and fluffy markings. Grandma kept up the feedings day and night. I helped. The painted bunting grew bigger and more colorful and got its flight feathers. Pretty soon she was pecking seeds right out of my hand.nd we took the bird on home. “Do what, Grandma?” I asked. “Set her flying to the winds,” she answered. “You love her, don’t you?” Grandma said. I thought for a moment. I gulped. I blinked hard. I opened the cage and slowly put my hand in. Sweet Magnolia jumped onto my finger. She clung to me with her little claws as if she didn’t want to let me go either. We boated to the bayou and went to the tree where we had first found her. She flapped her wings once but stayed perched on my hand. heard something. Then she flapped her wings and said CHEE-UP and took off over the trees where I couldn’t see her. Grandma cupped her hand on my shoulder. “Don’t feel bad, Denise. We’ll find you another Lagniappe,” she said. “What’s a lan-yap?” I asked. During the next few days, I saw fireflies as big as nickels and a water rat with a tail as long as my arm! Grandma and I spotted a huge, old alligator looking like a stiff, fallen log sunning its bumpy body. At dusk, we got out of the bayou before the mosquitoes started humming, and we listened to the bullfrogs croaking from the comfort of Grandma’s house. sighed a lonely sigh. Then I saw something. I reached in and took it and held it against my cheek. I showed it to Grandma and told her it was my lan-yap. “A lan-yap,” I answered. They looked at me as if I were crazy. I smiled. “A Sweet Magnolia feather. Tell you about it later.” First I needed to take my treasure out to look at it alone and put it in a safe, forever place. 5) Why does Uncle Stan think Scungy is unable to have any more lambs? 6) What does the phrase take shelter mean? d) a happy surprise for everyone at the farm. 8) What is the genre, author's purpose and point of view? 9) The narrator is unable to find Scungy because Scungy is resting where? 10) Give a character trait that describes Uncle Stan. - Summarize what happens in "Scungy's Twins." Use details from the passage to support your answer. “Isn’t it time we put Scungy in the orchard?” I called to Uncle Stan as I closed the gate. “We’ll put her in the orchard this afternoon,” Uncle Stan said. My brothers and I were staying on our Uncle Stan and Auntie Stella’s farm. We lived in the city, so it was always fun to come and stay on the farm. There were lots of exciting things to do, and we were always tired by the end of the day. It wasn’t a big farm, but therewere sheep, cows, and a farm dog that was really a pet. Best of all, there was a red tractor to ride on with Uncle Stan or Auntie Stella. against our legs. Scungy was skinny, and she didn’t have many teeth left. We all loved Scungy. Three years ago, Scungy had a hard time having her lamb. The lamb started to come early, when the weather was still cold. Auntie Stella heard Scungy baaing, and she went to see what was the matter. Auntie Stella was just in time to help Scungy with her lamb. The next year at lambing time, Uncle Stan decided to put Scungy in the orchard. The orchard had a lot of grass and a shed where Scungy could take shelter in bad weather. The orchard was also close to the house, so if Scungy got into trouble having her lamb, Uncle Stan and Auntie Stellawould be able to help. Scungy liked it in the orchard, but she didn’t have a lamb that year. When lambing time was over, we helped Uncle Stan put her back with the other sheep. “Perhaps Scungy is too old to have any more lambs,” Auntie Stella said. The same thing happened the year after that. We put Scungy into the orchard at lambing time, but she didn’t have a lamb. “I think Auntie Stella is right. Scungy is too old to have lambs now,” said Uncle Stan. lambs. Uncle Stan said the sheep had twins because his farm had special grass. But I’d seen a lot of twin lambs on the other farms along the road, so I knew Uncle Stan was teasing me. summer. Then the firewood could dry out over the summer, before Uncle Stan and Auntie Stella needed it in the winter. As we helped Uncle Stan put the wood on the trailer, I looked around for Scungy. “Have you seen Scungy?” I shouted to both my brothers. “No, not today,” they shouted back. “What about you, Uncle Stan? Have you seen Scungy?” I asked. trees or having a drink at the stream,” said Uncle Stan. I was worried. I ran down to the stream. Scungy wasn’t there, so I ran over to the trees. I’d found her! “Uncle Stan!” I called. “Come and see!” Uncle Stan and my brothers came running. Scungy was there resting under the trees, and playing beside her were twin black lambs! - Compare and contrast the two passages. Use at least two details to compare and two to contrast. 3) What would be a good title for this story? 5) What happened after Chipmunk’s argument with Bear? 6) Give a synonym for the word clever as used in the passage. 7) How is Chipmunk different from the other animals? 8) What is the genre, author’s purpose and point of view of this passage? 9) Give a character trait to describe the chipmunk. 10) What is the setting of the passage? - Compare and contrast the Bear and the Chipmunk. Give at two similarities and two differences between the characters. How is paragraph one organized? What would be a good heading for paragraph two? Name the four forces of flight and explain what each force does. Give a synonym for the word designed as used in the passage. Which force will your glider NOT have and why? Give some ways that airplane designers use lighter materials. Define the words carefully using the suffix –fully. Define the word overcome as used in the passage. Define the word managed as used in the passage. - What will you do to make your glider have less drag and weight? Give details from the passage to support your answer. 1) What is the genre, author’s purpose and point of view of the passage? 2) What is the mood or tone of this poem? 3) What would be another good title for this poem? 4) Describe the setting where the narrator is when they are writing this poem. 5) Describe the setting where the narrator would like to go. 6) Give an example of alliteration that is used in the passage. 7) What does the author mean when they say, “Yes we'll walk with a walk that is measured and slow”? - What does the author think about the place where he is when he writes his poem? Give details from the passage to support your answer. Long ago, the Earth was covered in darkness. None of the creatures living there knew what daylight looked like. One day, all of the animals of the forest gathered together in a clearing. They wondered if it would be better to remain in darkness, or if it would be better to also have light. Deer, Chipmunk, Raccoon, Wolf, Bear, and many other creatures climbed to the top of the highest mountain. The mountain stood so tall that there were no trees on its top, and it was covered only with rocks. Millions of stars blinked in the dark sky overhead. The biggest and most powerful animal in the forest was the bear, and he was the first to reach the mountaintop. Bear stood on the highest peak, looked out over the forest below, and argued for remaining in darkness. He said that the creatures of the forest would be able to sleep better in darkness because there would be no light to keep them awake. Most of the other animals were afraid, and they agreed with Bear. Raccoon said that he did not mind the darkness because he was so smart that he could find plenty of food, even in the dark. Wolf was easy to please, too. She didn't mind the darkness because she could howl in darkness or in light. But one animal did stand up to Bear. Chipmunk, the smallest of the animals, argued that it would be better to have both light and dark. Chipmunk was very clever. As Bear continued to argue for darkness, she made many good arguments for light. Slowly, the night passed. Bear grew tired of talking, but Chipmunk chattered on and on, as if she had all of the energy in the world. As the other animals dropped off to sleep, one by one, Chipmunk kept arguing. Finally, the first sunrise ever seen by the animals appeared over the top of the mountain. They woke up and were amazed by what they saw. Chipmunk began to dance from rock to rock. Bear became angry because he didn't get his way. He roared loudly and ran after Chipmunk. He chased Chipmunk all the way down the mountain. Bear was fast, and he reached out his giant paw to grab Chipmunk. Chipmunk got away, but not before Bear managed to scratch her back with his long claws. And that is why, to this day, you can see stripes on Chipmunk's back! 1 Have you ever been on an airplane? If you have, you may have wondered how they can fly. Airplanes are big. They are heavy. How can they fly through the air like birds? 2 A bird or airplane flying in the air has four different forces acting on it. There is a force that pushes up. There is a force that pushes down. There is a force that pushes forward. There is a force that pushes backward. A bird flying through the air can change the way that it moves to change the way that the forces act on it. People can make an airplane fly by controlling the way that forces act on it. 3 Gravity is the name of the force that pushes things down toward the ground. The force is greater for heavier objects than it is for lighter objects. That means that airplanes need to be light in order to fly. Airplanes are made with light materials. They use lightweight aluminum instead of steel. They use plastic instead of glass. Every little bit helps to keep the airplane as light as possible. 4 Airplanes are heavy, no matter how much we do to lighten them up. Airplanes have to create a force to push them up. That force is called lift. It has to be stronger than the force of gravity that is pushing it down. Airplanes create lift with their wings. Airplane wings are made to act like the wings of a bird. They are flat on the bottom and curved on the top. This makes the air move faster over the top of the wing than it does under the bottom of the wing. This means that there is more pressure under the wing than there is on top. The pressure under the wing pushes the wing up. It creates lift. Airplane wings are designed so that they will create enough lift to overcome the force of gravity pushing down on the plane. 5 As an object moves through the air, there is a force that pushes against it. This force is called drag. Drag is the force that you feel when you stick your hand out the window of your car as it is moving down the road. It pushes you backward when you are moving forward. An airplane moving forward through the air experiences drag. To continue moving ahead, the airplane must create a force to push it forward. 6 Thrust is the force that pushes an airplane forward. Airplanes create thrust using propellers or jet engines. They create thrust by pulling air in and then quickly pushing it out. It works just like a fan that you might have in your house. Thrust pushes an airplane forward. It helps to overcome the drag force that is pushing the airplane backward. 7 All of these forces can be carefully managed to get an airplane off the ground, keep it flying in the air, and help it to land safely back on the ground. 1) What is the genre and author’s purpose of the text? 3) How are wings shaped and how do they work? 5) Explain Newton’s Law of Motion. 7) Give an antonym for the word unique as used in the passage. 8) What would be a good title for this passage? 9) If you were to give paragraph three a heading what would be a good heading for that paragraph? 10) What bias does the author show about flight in the last paragraph? How can you use Bernoulli’s principle when designing your glider’s wings? Use at least two details from the passage to support your answer. 1) What is the genre, author’s purpose and point of view of the text? 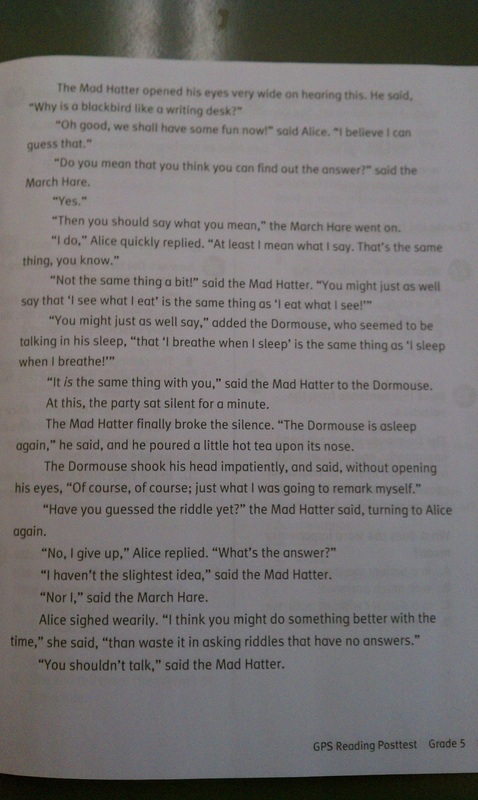 2) Who is the narrator in the passage? 3) What is the conflict and resolution of the passage? 4) Describe the setting of the passage. 5) Why was Susan able to keep Snowball? 6) Give a synonym for the word peculiar as used in the passage. 7) What would be another good title for this passage? 8) Based on what you have read give a character trait which describes Joy? 9) Give an antonym for the word famished as used in the passage. 10) Define the word doubtful using the suffix –ful. What word best describes Snowball’s personality? Use at least two details from the passage to support your answer. 2) What would be a good title for this passage? 3) Give a character trait that best describes the narrator? 4) How many stanzas does the passage have? 5) What would a good title be for this passage? 6) Give a character trait that best describes the narrator? Compare and contrast the poems. Give at least two similarities and differences between the two poems. 3 You can see for yourself the amount of pressure that air can exert. Take a drinking glass and fill it with water. Cover the top of the glass with a piece of heavy paper, like an index card. Carefully turn the glass upside down and let go of the paper. (It's best to do this over a sink, just in case.) If the paper completely covers the glass, the paper should hold the water inside the upside-down glass! What holds the paper in place, even with the weight of the water pressing down on it? The answer is air pressure! Molecules of air press against the paper, holding it onto the glass. The amount of air pressure outside the glass is greater than the weight of the water in the glass! 4 Daniel Bernoulli (Bur NEW lee), a Swiss mathematician, was the first to describe in 1738 a unique property of moving fluids. Bernoulli found that the pressure exerted on surfaces by a moving fluid decreases the faster the fluid flows. This is known as Bernoulli's principle. Bernoulli's principle can be used to explain how heavier-than-air objects can fly. 5 Airplane wings are shaped relatively flat on the bottom and curved on the top. Because of this unique shape, air flowing over the top of the wing moves faster than air flowing under the wing. As the wing moves through the air, the pressure under the wing becomes greater than the pressure above the wing. This results in an upward "push" on the wing. This upward force due to differences in air pressure is called lift. When the lift is greater than the weight of the object, the object will rise. 6 Another reason that an airplane can fly has to do with Isaac Newton's third law of motion. Newton's third law explains how a rocket lifts off the launch pad into space. When the rocket engines start burning up the fuel, hot gases escape from the bottom of the rocket. As the gases leave the bottom of the rocket engines, the force causes the rocket to launch in the opposite direction. Since the shape of an airplane's wing gives the air flowing over it a downward force, then by Newton's third law there will be an equal and opposite upward force. There is some debate about "Bernoulli vs. Newton." Some people think only one explanation is correct for lift. Both Bernoulli and Newton were right. Perhaps each of them just had a unique way of looking at a problem and a unique way of stating the principles or laws behind their observations. 7 What makes an airplane fly? The simple answer is that the air under the wings pushes up more than the air above and the weight of the airplane itself pushes down. The special shape of an airplane's wings makes the air move around the wings in a certain way. 8 Wings have a shape called an airfoil. The angle of attack is the angle that the front of the wing gives the oncoming air. The thicker the wing is on its front surface, the thicker the chunk of air it forces over the wing. The more air that flows over the upper surface of the wing, the more lift the airplane has. Wings (and the airplane) are forced upward because they deflect air. 9 You can try this for yourself the next time you're riding in a car. Put the window down and extend your arm out the window. Keep your hand flat, fingers together, with the thumb on the front facing the same way the car is going. Depending on how fast the car is moving, you'll feel some force pushing your hand and arm. Now tilt your hand, aiming your thumb toward the sky at an angle. Your hand will be forced upward. The faster the car is going, the more force you will feel lifting your hand. Tilt your thumb downward, and your hand will be pushed downward. Experiment with the angle of your hand to see how you can get the most lift. 10 For hundreds of years, man watched birds and tried to understand the secrets of flight. Only in the last hundred years, since the Wright brothers first flew in 1903, has man been able to design a machine that could actually fly. Only sixty-six years after the first Wright brothers' flight, which lasted for only 12 seconds, men flew to the moon! It is amazing what humans have been able to do in a short time period. Who knows what the next sixty-six years will bring? Why, oh why, does a bird fly? As I spy it go by. Why, oh why does a bee fly? Why, oh why does an airplane fly? And I know you're on the inside... lookin' out. Hello, my name is Snowball, and I am a five-year-old, male, white, longhair Persian cat. I understand that Cats are not supposed to think about what they want to say. They are not supposed to think at all; at least that is what humans say. Well, that is not true. If I could talk, I would tell you about the many things I have seen and all the numerous things I know. In other words, there is a lot I want to write. You probably think I am crazy, but what is crazy about getting things off your chest? First, I am a peculiar cat. I think a lot about everything, and I analyze everything. I was merely five months old when a teenage girl found me in west Los Angeles. I was starving and had been left for dead on the street. Susan found me and took me home, saving my life. I was so tired and famished that I immediately dozed off after eating a huge can of cat food. When I awoke, there was still plenty of food for me. It was a regular all-you-can-eat cat smorgasbord. There was dry food and wet food, and the choice was mine. I could eat until I was satiated. I was so thrilled that I had found a new home, one equipped with plenty of food. I was king of the castle and I still am today. Joy is Susan’s mother and Marty is her father. At first, Marty was doubtful about my becoming a member of the family, but Joy convinced him to let me stay. They had some new rules that I had to follow. I had to learn to use the litter box in the bathroom, and I was not allowed outside of the house unless Joy or Marty accompanied me. For my own safety, I could not stay long outside, and I had only five minutes to roll in the grass and sniff the trees in front of our residence. There are canines in our neighborhood, stupid, drooling creatures with bad breath that find it funny to chase us finer felines. Despite my lack of time outdoors, life was just fine, until Coco came along. Coco is the other cat that lives with me now, a female Calico that came to the back door one November day after a heavy rain. She was only four months old and she was hungry. Joy let her in, fed her and kept her. Cats tend to be extremely territorial and do not like interlopers coming into their territory. Coco had to learn who the boss was, ME! We fought constantly until we made a truce, but even though we get along now, I never let her forget who rules the roost! Read the passage all the way through and then answer the questions below. 1) What is the genre, author’s point of view and author’s purpose of the passage? 2) What is the conflict and resolution in the passage? 3) What is this passage mainly about? 4) What would be a good title for this story? 5) What is the theme of the passage? 6) How did Susie show her mom that she was responsible enough for piano lessons? 7) What does the word responsible mean? 8) Why was Susie surprised after her first piano lesson? 9) Why did Susie’s mom sound stern when Susie told her she was going out to play? 10) List a simile given in the passage. Explain what it is comparing. 11) Define the word understandable using the suffix –able. - Was Susie happy getting piano lessons? Why or why not? Give details from the passage to support your answer. Describe the force of life. Describe the force of drag. Give a metaphor from the first paragraph. What is it comparing? - How can a glider use Bernoulli’s principle? Give details from the passage to support your answer. 1.) What is the genre, author’s point of view and author’s purpose of this passage? 3.) What might the star become when it dies? 4.) In this poem, the word pulsating means what? 5.) What would be another good title for this poem? 6.) How long does a star live? 7.) Give an exaggeration that the author uses in the passage. 8.) Define the word finally using the suffix –ly. 9.) What do you think the word aloof means? 10. )Give an antonym for the word massive as used in the passage. - What bias does the author have about stars? Give at least two details from the passage to support your answer. Susie loved to hear her older sister, Emma, play piano. Listening to the pretty notes and watching Emma’s fingers press the keys made Susie want to play music too. But every time Susie asked to play, her mother would tell her how much work it was to learn to play piano well. Emma made it look easy. Susie was sure she could learn to play even though she was a few years younger, so she decided she had to prove to her mother that she was ready for the responsibility. Susie helped her mom around the house by washing the dishes and dusting. “Mom, can I start taking piano lessons?” Susie asked. “Susie, as long as you understand that you are going to have to practice every day, you can take piano lessons,” her mom said. “I think that is understandable,” replied Susie. Susie was so excited. She could not wait to play “Twinkle, Twinkle Little Star,” one of her favorite songs. In no time, she thought, she would play as well as Emma! Susie was excited and nervous for her first piano lesson. When she finally got there, she was surprised; her teacher had flashcards and a book for her. Emma just had music notes in her piano books. Susie did not know there were so many other things to know about the piano first. She had to learn each of the notes, or the sounds, that the piano makes. Then, she had to learn which key on the piano made each note. There were even Italian words she had to learn! Her teacher showed her everything she had to practice and learn before the next lesson. During that first lesson, Susie never even got to touch a key on the piano. “Don’t people get to play piano at piano lessons?” she wondered. The next day, when Susie got home from school, her mom had her snack all ready. She ate it fast as a rabbit escaping from a cage, and started to run outside. “But mom, everyone is playing kickball,” Susie whined. “Susie, this is what you wanted, now you have to follow through with it,” her mom said. 1 To anyone born during the last one hundred years, seeing a "metal bird" glide through the sky is not unusual. In fact, it is hard to imagine a blue sky without airplanes and jets racing effortlessly to their destinations. So, what is the magic behind these fascinating machines? Mechanical energy and air are the main reasons airplanes and other airborne vehicles fill our skies. Let's look at the aerodynamic principles behind flight. 2 Aerodynamics focuses on the motion of air and other gases. Scientists who study aerodynamics use this information to design aircraft that travels efficiently in the air with very little air resistance. Air resistance is the force or friction that a vehicle experiences as it travels through the air. In aerodynamics there are three basic forces called thrust, drag, and lift that affect how an airplane travels through the air. Thrust is the force which moves the airplane forward. Drag is the force that holds the airplane back as it is flying through the air. Finally, lift is the upward force that opposes earth's gravitational pull. It is the lift that helps to keep the airplane in the air. To explain the science behind lift, we need to look at the work of Swiss mathematician Daniel Bernoulli (1700-1782). 3 During the 1700's, Bernoulli discovered that when fluid and air move along a surface, they cause a force to be exerted or applied at a right angle to that surface. Bernoulli also discovered that faster flowing fluid and air causes less force than slower moving fluid and air. This amazing discovery is referred to as Bernoulli's principle. So what does this mean for airplanes? Well, the pressure of air decreases as its velocity increases and increases when the velocity decreases. Airplane wings are curved to use this principle to their advantage. As air flows over the curved upper surface of the wing, it moves faster than the air flowing across the flat under surface of the wing. The air flowing over the upper surface also has farther to travel than the air flowing across the under surface of the wing. The pressure of the air is applied in an upward direction, hence the term "lift." The airplane's wings intersect the air at an angle. This wing angle allows the air to be deflected or sent downward, which causes the airplane to be deflected upward (think about Newton's third law). The high air pressure under the wing is responsible for pushing the plane upward. This allows the lift to support the weight of the airplane while it is in flight. 4 An airplane's thrust is supplied by the airplane's engine. Most airplanes have gas-turbine engines that move propellers. Propellers have blades that are in the shape of an airfoil. This means they have a leading edge (edge facing direction of motion) and a trailing edge (rear edge). The blades of the propeller are moved by a shaft that is attached to and driven by the engine. In jet engines, it is the force of the hot gases exiting the rear of the jet that causes the reaction or thrust of the jet. 5 Air resistance is the reason for drag on an airplane. As the thrust or forward motion of an airplane increases, the drag increases. The airplane's thrust needs to be greater than the drag in order for the airplane to move forward. This is why pilots need to know about weather conditions before they fly. Tailwinds or winds coming from behind the aircraft may help to increase the thrust of the airplane and speed up the airplane's movement. Headwinds, winds that come from the opposite direction of the aircraft, can add more resistance to the airplane's thrust and as a result slow down the aircraft. It is all three aerodynamic forces that help aircraft to achieve flight. and when were you born to the sky? and how will you finally die? to aid in the birth of the same? filling the sky with your light? that keeps perfect time in the night? a tunnel to some other place? that time passes on far below? everyone loves you more than life itself. that all life is able to be! 1) What genre is the text and how do you know? 2) What point of view is the text written from? 4) What does the word runnin’ mean as used in the passage? 5) What month can you infer it is and how do you know? 6) What is the conflict and resolution in the passage? 7) Describe the flight and how you fly the plane. 8) What is the setting of the passage? 9) What is the weather like during the flights? 10) Define the word thunder as used in the passage. - Was the first flight an easy or hard thing to accomplish? Give details from the passage to support your answer. Center #3: Nonfiction (When Men Took Flight) Read the passage all the way through and then answer the questions below. 1) Define the word inventors using the suffix –or. 2) Describe the first glider. 3) How many years did the Wright Brothers spend testing their gliders? 4) What did they do differently to their glider to make it stay up longer? 5) How long were they ultimately able to fly their airplane. 6) Where were the Wright Brothers from? 7) Who designed the engine for the first plane? - Was making the plane easy or difficult? Give details from the passage to support your answer. Center #5: Poetry Read the passage all the way through and then answer the questions below. 1) How do you think the author feels? 2) What do you think the author means by “Spare me no pity”? 3) What is the point of view is this written from? 4) According to the poem, what does brightest and darkest mean using the prefix –est? 5) Give a synonym for the word swells as used in the passage? 6) Where do you think the author wants to be? 7) What do you think “flight means freedom” means as used in the poem? 8) What is another good title for this poem? 10) What do you think the author is doing? Why does it seem like the author wants to get away? Give at least two details to support your answer. 1 "Hey, Jimmy, you gonna do some fishin' today?" asked Jordan as Jimmy walked past the bait and tackle shop. 2 "Yah, I was hopin' to give it a go for a little while. Don't know if there will be much runnin' today or not. Sure is cold, ain't it?" asked Jimmy. 3 "If you get down there by the straights, you better watch out for them fellers from up north with that flyin' contraption," said Jordan. "Those Wright boys are back at it again. They're gonna mess around and kill themselves with that thing. If folks was meant to fly, they would'a had wings." 4 "You may be right, Jordan, but it sure would be fun to be able to glide over the trees like a bird. Just think of the view from up there," said Jimmy as he wandered on down the path to the beach. 5 Jimmy heard a loud roar and lots of yelling just as he came around the next sand dune. What in thunder was all that about? He raced to see what was going on. 6 Then he saw it. One man was lying flat on his stomach on that big winged thing. Hard to tell what it was, but it had to be that contraption that the Wright boys brought down to the coast of North Carolina from Ohio. 7 Just then, it lifted off the ground a little bit. It tipped to the left and then to the right. Then it did some sort of little bobble and nearly went nose first into the sand. After that, the front came up, and it went on over the beach a few more feet. That fellow set it down on the ground just as pretty as you please. 8 Jimmy stood there in amazement as he watched the men run to the little craft. Then they all gathered around and helped the man that was on his belly off the machine. They all shook hands and clapped each other on the back. Pretty soon they carried it back up the beach to where they had started from. 9 One of the men saw Jimmy standing there and yelled for him to come on over. Jimmy recognized him as Mr. Brinkley. He had a business in town. 10 "Hey, Jimmy. You want to earn yourself a quarter?" asked Mr. Brinkley. "This here is Mr. Orville Wright and his brother Wilbur. We could use a hand carrying this airplane back here after the next flight. You up fer it?" 11 "Sure, I'd be glad to help," said the boy. 12 "Okay, Wilbur, it's your turn. You give it a try," said Orville. "See if you can't make her fly a little higher." 13 Wilbur did. He managed to get that machine off the ground about ten feet. It flew a little farther down the beach this time, too. It was still a little wobbly, but it definitely flew. 14 After both men had another go at it, the wind started to pick up a bit. On the fourth trip back up the beach, it was all the men could do to hold on to that flying contraption. Then a big gust of wind came up and flipped the thing right over. Try as hard as they could, all of the men working together couldn't hold it down. 15 "That pretty well does it for us today, men," said Mr. Wilbur Wright. "There is some pretty severe damage to the flyer, and we will have to fix that before this machine will fly again. Let's see if we can get this thing put away in the shed and then get something warm to drink." 16 Once everything was packed away, Mr. Brinkley patted Jimmy on the back and said, "Here's your quarter, Jimmy. We paid you today, but one day people will be paying big money to see these machines fly. You mark my words." 1 In 1903, a reporter for The New York Times wrote an article. He had heard stories about some inventors. These inventors wanted to invent a machine that could fly. After researching his article, the reporter came up with one conclusion. He decided that man would be able to make a plane that was lighter than air in one to ten million years. Nothing he had seen could convince him that man would ever fly like the birds. Little did that reporter know that even while he was writing his article, the idea of flight was coming closer to becoming a reality. 2 Wilbur Wright and his brother had been experimenting since 1899 with flying machines. Their first plane was a glider. It was powered by the wind. This first glider cost only $15 to construct. It measured sixteen feet from wingtip to wingtip. The Wright brothers owned a bicycle shop in Dayton, Ohio. They used their knowledge of machines to build a glider that could be steered in the wind. A means of steering would enable the flyers to control where they went. They ran a wire from the tip of each wing. This wire led to steering sticks at the center of the glider. Moving these sticks let the pilot turn left or right. 3 The success they found in constructing a glider led the two men to another level. They decided that they could attach a small engine to their glider and stay in the air for longer periods of time. In 1900, they moved their experiment to North Carolina. They had a friend who studied weather. He convinced the brothers that the wind at Kitty Hawk, North Carolina, would be perfect for their tests. A sand dune named Kill Devil Hill would also keep them hidden from the curious eyes of the public. For two years, Wilbur and Orville tested their gliders. With each test they learned more. They revised the construction of their glider and built new ones when necessary. Their last glider was called the Wright Glider of 1902. It made over one thousand flights. 4 In 1903, they were ready for the next step. They had an employee from their bicycle shop design an engine. It had to be small enough that it wouldn't weigh the plane down but powerful enough to lift the plane off the ground. Would it surprise you to know that the chain that was used in the engine was off a bicycle? The brothers carved propellers that the engine would turn. They were ready to try out their new invention. 5 Just eight days after the New York reporter stated that it would be more than a million years before man would fly, the Wright brothers took flight. It was December 17, 1903. Orville piloted the first flight. He traveled 120 feet in twelve seconds. Each brother got to pilot the flying machine twice that day. On the fourth flight, Wilbur guided the plane 852 feet and was in the air for fifty-nine seconds. Luckily, there were five other people present for this historic flight. They might not have been believed otherwise. 6 This historic first plane cost a little more than the brothers' first glider. The Wright Flyer was constructed for a little less than $1000. It had a forty foot wingspan. The plane itself weighed only 750 pounds. It carried a twelve horsepower engine weighing 170 pounds. 7 The Wright brothers returned to Dayton, Ohio, in 1904. They continued to perfect their new invention. Near the end of that year they were able to circle over a field outside of town for five minutes at a time. They decided that it was time to share their success with the public. Orville and Wilbur invited a group of journalists to come and observe a flight. Unfortunately, they had a mechanical problem with the plane. They were unable to fly. The problem took several days to fix. In the meantime, the press accused them of playing a hoax on the people. They were branded as liars and fakes. 8 The U.S. Army was interested in purchasing a plane for military purposes. The men would not sign a contract with the Wrights until they saw for themselves that the machine would fly. The Wright brothers refused to exhibit their plane after they were embarrassed by the press. Two other inventors, Alberto Santos-Dumont and Glenn Curtiss took credit for inventing an airplane for the future. The Wright brothers hid the fact from the public that they had staged a flight of over thirty-nine minutes that took them a distance of 24 ½ miles in 1905. Glenn Curtiss took credit for making the first American flight in July of 1908. 9 A month later, the Wright brothers signed a contract with the U.S. Army. Only then did they reveal to the public their superior flying machine. Wilbur Wright guided the Wright Flyer in a series of difficult maneuvers. The world could now see the future two young men from Ohio had dreamed of for years. 2. What is the climax of the passage? 4. What would be a good title for this passage? 5. Why did the stranger take the paper dragon outside without permission? 6. How did people feel after holding the paper dragon? 7. List a simile that was given in the passage. 8. Define the word colorful using the suffix –ful. 9. Define the word happily and brightly using the suffix –ly. 10. What is the theme of the passage? - What do you think the Paper Dragon would do next? Give details from the passage to support your answer. Center #3: Nonfiction (The Horses of Chincoteague) Read the passage all the way through and then answer the questions below. Why did the author convince her parents to take her to these islands? What does the word channel mean in this passage? How are Chincoteague and Assateague ponies different from ponies that don’t live near the ocean? Why are the horses made to swim from Assateague to Chincoteague? From what point of view is this passage written from? What genre is this text and how do you know? What is the author’s bias about the ponies? How is the second paragraph organized? Define the word culling as used in the passage. - Is life difficult or easy for the ponies? Give details from the passage to support your answer. Why is the narrator worried in the first stanza of the poem? What is the main idea of this poem? What game can you infer this girl playing and why? Give a fact from the poem. Give an opinion from the poem. Define the word arch as used in the passage. Define the word sinking as used in the passage. - What do you think the author’s feelings are about the game they are playing. Give at least two details from the passage to support your answer. 1) Complete the 10 Study Island questions on Setting and write down your score. 1) Complete the 10 Study Island questions on Theme and write down your score. When I was a child, one of my favorite authors was Marguerite Henry. She wrote about wild ponies that live on the Island of Chincoteague. Chincoteague is an island off the coast of Virginia and Maryland. For hundreds of years, wild ponies have lived on Chincoteague’s neighboring island, Assateague. The ponies, like the ones in Henry’s book, get to Chincoteague each year by swimming across the channel between the two islands. Locals round up some of the wild ponies from Assateague and swim the ponies across the channel between the two islands. Once the ponies get to Chincoteague, they are auctioned. The ponies adapt well to domestic life, and the culling, or removal, of some of the horses helps keep the wild pony herds healthy. Because I read so many of Henry’s books about these two islands, I developed a mental picture of how they would look. All of the beautiful descriptions found in these books helped me create pictures in my mind, and I could just imagine the ponies prancing along the beach and swimming across the channel. I desperately wanted to go there to see the wild ponies. After much pleading, my parents agreed to take my family on a vacation to visit these islands. We drove through the middle of the night so we could spend the whole next day touring the islands. We arrived before the sun rose. Because it was so dark, no one in my family realized we had parked next to a paddock that held a herd of horses. Just as the sun started to come up over the horizon, we heard the whinnying of ponies and the pounding of hooves. We awoke to ponies galloping across the field. It was just like I had imagined. There was so much I wanted to learn about the islands while I was there, but I really wanted to learn about the ponies. I had an idea of what they were like from the books I had read, but it was exciting to see them with my own eyes and learn everything I could about them. While my family vacationed in Chincoteague, I learned many things about the wild ponies. The Chincoteague ponies come in all shapes, sizes and colors. Because of their diet, these ponies have very round bellies. When the ponies are in the wild, on Assateague, they live a difficult life. They forage for food in the salty marshlands eating marsh grasses, seaweed and even poison ivy. Because their diet is so high in salt, they must drink twice as much water as typical ponies. Though they live on an island, they cannot drink the salty ocean water; therefore, they must find fresh water inland to drink. Although these wild ponies have difficult lives, they have survived many hundreds of years in the wild. The ponies are a significant part of the history of the islands of Chincoteague and Assateague. I was so glad I was able to see them in person. The books of Marguerite Henry introduced me to a place I had never before been able to visit. Through these stories, I learned about the beautiful ponies living in the wild and the process they go through when they are domesticated. Without reading Henry’s books, I may have never known of the wonders of these islands, and I may never have been so determined to visit. You too can begin learning about these beautiful, wild horses by reading one of Marguerite Henry’s most famous books, Misty of Chincoteague. Once upon a time, on a wall in a little house in a country far away, there hung a beautiful paper dragon. It was carefully folded and looked almost like it was a real dragon. The dragon was painted the colors of the rainbow, and its tail was spread wide like the tail of a peacock. Many years went by, and the people who lived in the house enjoyed the picture of the colorful dragon. People who came to visit the house stopped to see the brightly-colored dragon, but no one ever asked about where it had come from. A couple of times, someone took it down from the wall, only to put it on another wall in the little house, and arrange the tail slightly differently. Doing this, they felt a vibrant feeling of energy and of life. Something about holding the paper dragon made them feel free. Once, a stranger on his journey passed by the house and happened to see the beautiful dragon hanging on the wall. Struck by its beauty, he stared closely at the dragon. Without asking permission, he lifted down the dragon from the wall. He hung it over his arm and went out into the yard. With skilled fingers he tied a string around the dragon's body and quickly went to an open place. As a breeze began, the stranger carefully let out the string and ran into the wind. Up the dragon lifted into the air and it soared high above like a kite. The dragon seemed to be pulling higher and higher into the air, almost as though it was flying. The people who lived in the house came outside to watch the man with the dragon. They were surprised to see their beautiful paper dragon flying above them, brightly colored with its long tail flowing behind it. They began to think that, maybe, there was something about this dragon that they had not noticed before. And the game is tied. But I am worried I might miss. Sinking the first shot swish right through the net. Can I make it a two-point game? I make it once again. Who will win the game now?